The number of visually impaired people in South Lakeland is expected to rise by over half by 2030 to 3,500 and with Cumbria’s super-ageing population and rurality, it is becoming increasingly important to offer assistance to people in their own homes. Deteriorating eyesight can be very stressful, leaving people isolated, vulnerable and dependent. Sight Advice South Lakes, based at the Bradbury Centre in Kendal, received £2,500 from the from the Holehird Trust and Dowker Bindloss Fund to contribute to the salary of a community development worker who provides advice and information about aids and equipment people can use in their own homes. They also provide advice and emotional support to help people live as independently as possible. Many people who benefit live in isolated rural areas, and most of those who are working age are unemployed. 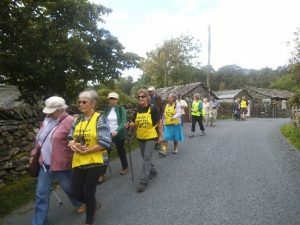 One older gentleman first received advice from the charity’s Eye Clinic Liaison Officer (ECLO), based at the Westmorland General Hospital, in September 2014 after Age Related Macular Degeneration and a stroke had caused visual impairment. He made contact a year later following further deterioration in his sight and the loss of his wife. The community development worker came to his home and showed him a range of products to help improve his daily living. He was given emotional support to deal with his bereavement, and after a physical assessment was given the right aids to improve his mobility. He has since joined the Positive Steps group where he learnt about equipment to keep people independent, and met other people with similar problems. 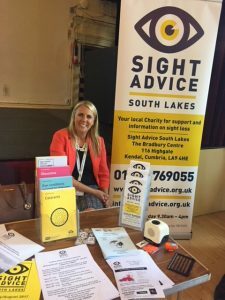 Sight Advice South Lakes has been providing help and advice to visually impaired people since 1956 and the small team of staff is supported by 140 volunteers. It offers support across South Lakeland including sessions in Windermere, Arnside and Sedbergh.